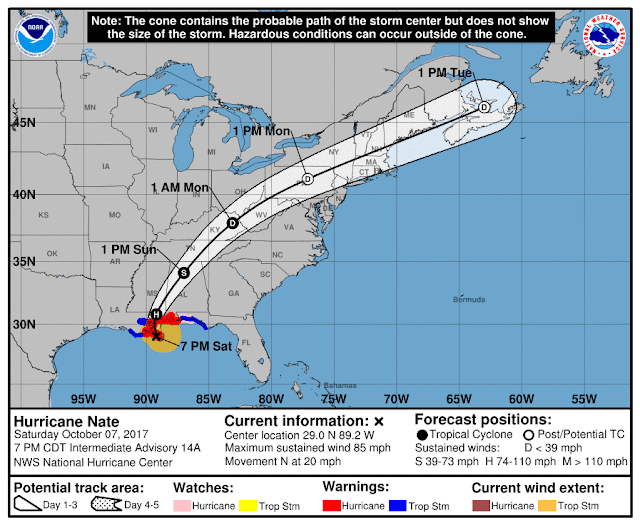 The image below, a forecast for October 8, 2017, run on October 7, shows Hurricane Nate near New Orleans, with winds as fast as 83 mph or 134 km/h (at 850 mb) and up to 5.33 in or 135.4 mm (3-hour precipitation accumulation) of rain (at the green circle). Early forecast also showed as much as 6.1 in or 154.9 mm of rain (3-hour precipitation accumulation) hitting the Mississippi coast. The NOAA image below also shows the track over North America as forecast over the next few days. Nate, the fourth major storm to strike the United States in less than two months, killed at least 30 people in Central America before entering the warm waters of the Gulf and bearing down on the U.S. South (Reuters report). 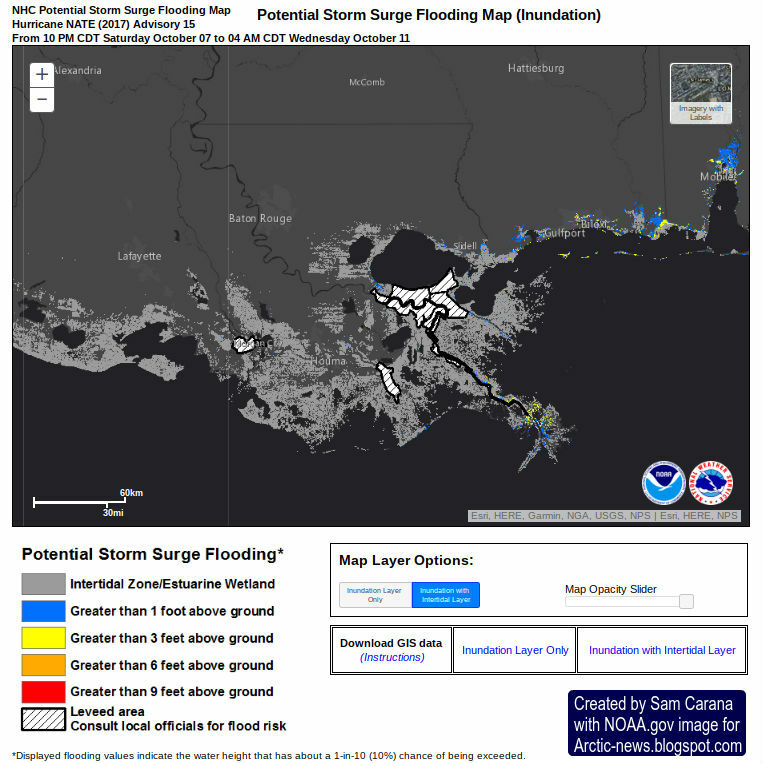 One of the biggest dangers is storm surge flooding, as illustrated by above image and the tweet below. 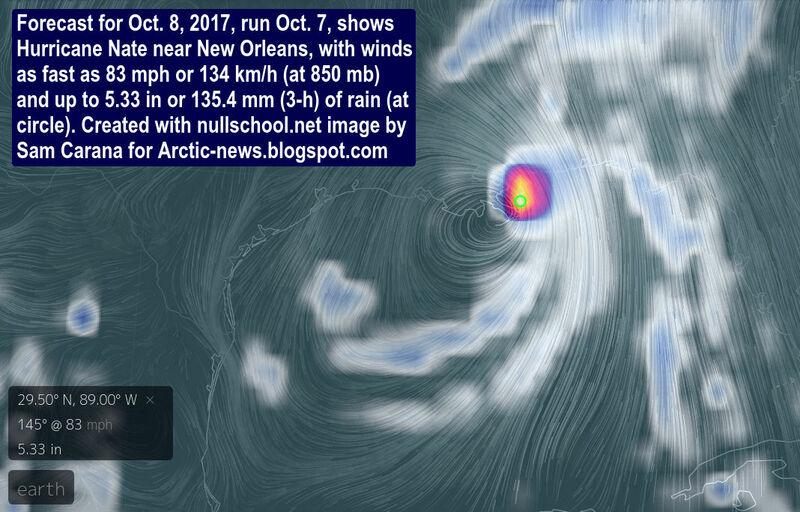 As the world keeps warming, hurricanes are increasingly causing damage, as also discussed in a recent post. The situation is dire a calls for comprehensive and effective action, as described at the Climate Plan.